This prize is awarded annually to the university student who has made an outstanding contribution to the Crichton Campus in the Dumfries and Galloway region. 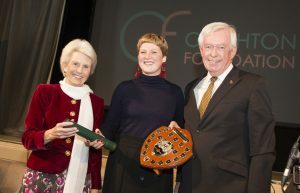 It was established following a bequest from the late Sir David who was the founding Convenor of the Crichton Foundation and it is awarded in his memory. The 2018 winner is Leonie Lepple. The Foundation’s Awards Committee selected Leonie as the winner from the nominations submitted from both the Universities of Glasgow and the West of Scotland. Leonie is studying for a BSc Environmental Science and Sustainability at the University of Glasgow in Dumfries. Originally from Germany, she trained as a nurse before travelling the world and changing her career path. Alongside her studies Leonie works part time as a carer, she is a student ambassador, she is an e-mentor for the Universities Ask a Student web site, she worked tirelessly to meet and greet the 200 or more interviewees who attended the campus for their interviews for the MA in Primary Education, she is a winner of the university wide ‘My Story’ competition and she is actively involved in the Crichton University Campus Boat Club. In her free time Leonie has set up a food blog on Instagram, Ginger & Strudel, along with her flatmate. This promotes affordable and healthy food options for students. Leonie is described by tutors as “showing enthusiasm with everything she does” and “a credit to herself in the roll of student ambassador.” Leonie is a very worthy winner of this prestigious prize.